Preservation Versus Restoration: What’s the Future of the Mill? An arsonist’s fire left the Mill in ruins and TTMAC with a choice: Preservation, Conservation or Restoration. Shortly after the devastating 1998 arson that gutted the historic Chapman – Beverley Mill, members of the Turn the Mill Around Campaign had to make a decision. With the Mill now in ruins, what would be the aim of the organization – to conserve, preserve or restore the Mill? After speaking with structural engineers and finding that restoration was impossible due to the weakened state of the stone in the walls, TTMAC embarked on an effort to conserve and then preserve the Mill in its ruined state. But what does that all mean? Read Karen Kroslowitz’s article ‘Preservation, Conservation, Restoration: What’s the Difference?’ for definitions of each term. Here at the Mill, the stabilization of the structure’s walls, completed in 2006, is like a form of interventive conservation. 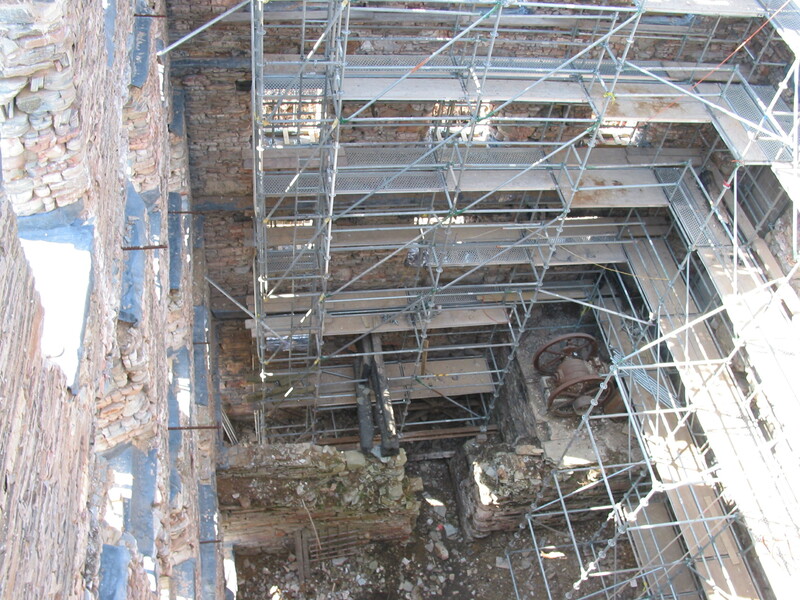 The goal of the internal anchoring system is simply to mitigate the existing damage and to enable the Mill’s walls to safely stand without further stone loss. The lead sheeting that you see on the Mill’s windowsills is a form of preventive preservation. Its function is to prevent water from seeping into the walls, the freezing and thawing of which would result in additional stone fracturing. While the Mill will never be restored to its former glory, it remains preserved as a testament to Northern Virginia’s agricultural history. How tall is this Mill again? The Chapman – Beverley Mill is thought to be the tallest stacked stone structure in the U.S., but how tall is it? Look around the web and you’ll see the Mill cited as anywhere from four to seven stories. So, why all the confusion? Well, we can boil it down to two factors: the 1998 arson and slope. Let’s deal with the arson first. 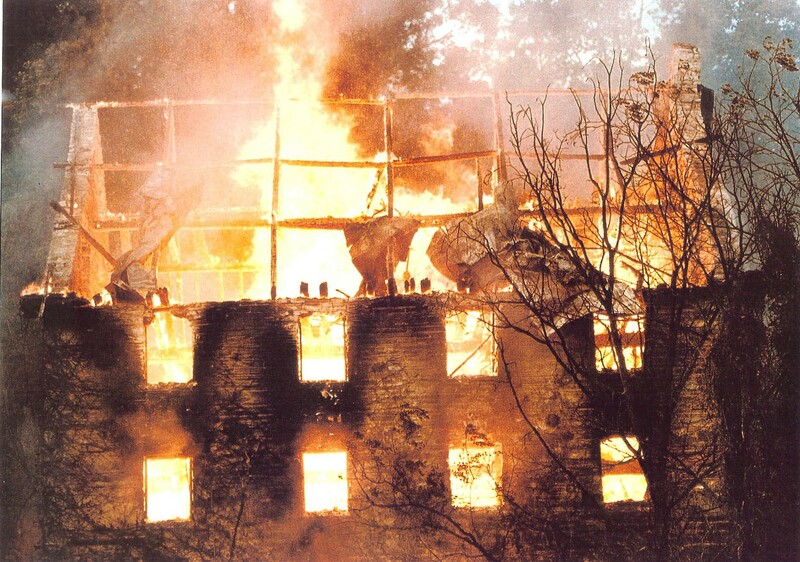 When the Mill burned in 1998, the gable ends of the structure were badly weakened. The decision was made that for the safety of those fighting the fire, the gables must be removed. So, using fire hoses, they were knocked down. What remains of the ends is one story shorter than the Mill originally stood. Now, let’s consider slope. As it approaches Broad Run, the land slopes considerably downward. The result is that the Mill’s eastern wall is approximately 1.5 stories shorter than the western wall. So, when you put it all together, the Mill walls originally stood a staggering 7 stories high on the west and 5.5 stories high on the east! They currently stand at 6.5 stories and 5 stories respectively. The Mill is about 50 feet long and 40 feet wide. Its walls are 6 feet thick at the bottom and 2 feet thick at the top. They contain roughly 1,522 cubic yards of stacked quartzite stone. They weigh approximately 3,500 tons!